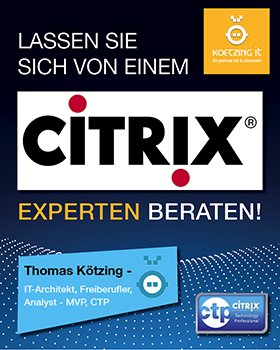 Meiner Meinung nach ist Citrix Director das beste an XenDesktop 7, sollange es nicht als Ersatz für EdgeSight angesehen wird. Das ist es aber was Citrix gemacht hat und meiner Meinung nach ein Fehler. Für Kunden die wirklich EdgeSight genutzt haben oder dies noch immer tun ist das "neue" EdgeSight mehr oder weniger ein Witz. Für diese Kunden muss Citrix deutlich mehr machen oder mal wieder eine andere Firma/Software Kaufen wie "Nexthink". Nochmal, Director "EdgeSight" ist eine tolle Integration aber hier ist meine Liste was besser sein könnte und hoffe Citrix wird in den nächsten Versionen was machen. Zeit ist an important value for authentification and other things and the reason to ensure from the beining it's working in your setup. Deploying Citrix Netscaler in a High Availability (HA) paair is very common, especially when we are talking about the VPX editions. First thing you should ensure is that the time between both Netscaler are in sync. Let's start with there should be an Option in the Internet Information Service (IIS) application settings to set the default domain and hide the entry. It's really not that hard, so I don unterstand why Citrix isn't doing it. Here a short description how to permanantly set your domain and then hide the domain filed from the Citrix Director logon page. In my opinion, Citrix Director is the best peace in XenDesktop 7 if you don't see it as a replacement for EdgeSight. That is what Citrix does, calls it an EdgeSight replacement but again, in my opinion, was a mistake to do. For customer who really used or still use EdgeSight, the "New" EdgeSight is more or less a joke. For those customers, Citrix must come up with something else or acquire another software or company for it like "Nexthing". Again, Director "EdgeSight" is a nice integration but here is my list that could be better and let's hope Citrix will do something about it. Time is an important value for authentification and other things and the reason to ensure from the beining it's working in your setup. Deploying Citrix Netscaler in a High Availability (HA) paair is very common, especially when we are talking about the VPX editions. First thing you should ensure is that the time between both Netscaler are in sync. Fangen wir damit an, dass es eine Option dafür im Internet Information Service (IIS) Anwendungseinstellungen geben sollte um die Domäne zu setzten und zu verstecken. Das ist wirklich nicht so schwer und verstehe nicht warum das Citrix nicht von Anfang an gemacht hat. Hier eine kurze Beschreibung wie die Domäne permanent vorgegeben und in der Citrix Director Anmeldung versteckt werden kann.